Cooked to perfection is this gourmet entree of seared scallops topped with hollandaise sauce served to guests staying at the Tuckamore Lodge in Main Brook, Newfoundland. Sprinkled atop the sauce and laid out on the seared scallops is a gourmet presentation of special types of herbs. The best type of drink to serve with this entree is white wine as the two blend together nicely. This gourmet entree is created by the chef who works at the Tuckamore Lodge and guests who stay here while visiting Main Brook, Newfoundland are served some of the best meals. Anyone looking for five star accommodations, do not have to look any farther than this unique destination in the wilderness of Newfoundland, Canada. 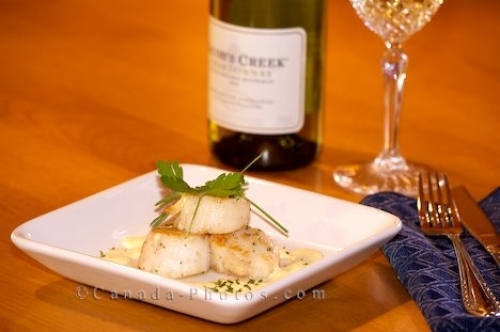 Picture of a gourmet entree of seared scallops served with white wine at the Tuckamore Lodge in Newfoundland, Canada. ... sauce served with a glass of white wine, Tuckamore Lodge, Main Brook, Viking Trail, Trails to the Vikings, Great Northern Peninsula, Northern Peninsula, Newfoundland, Newfoundland Labrador, Canada.